A sketch becomes reality... the homeowner dreamed of an outdoor kitchen to entertain at their lake house. 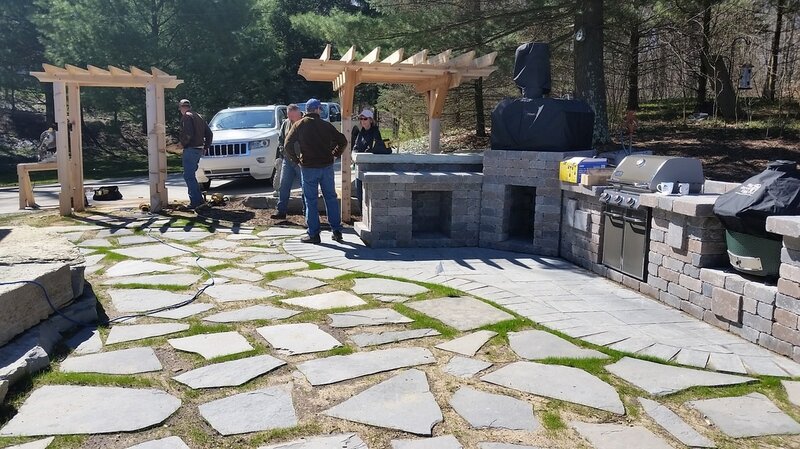 The outdoor kitchen is almost complete. The homeowners decided to install a stone patio with grass joints to soften the hardscape around the house. Beach, retaining wall and steps completed. Waiting for plants to fill in. Manning Design worked closely with the homeowners to help them visualize an outdoor living space that will accommodate their large family gatherings at their summer home. The design is evolving to create a balance between their budget and their dream. Construction started in the spring of 2018. 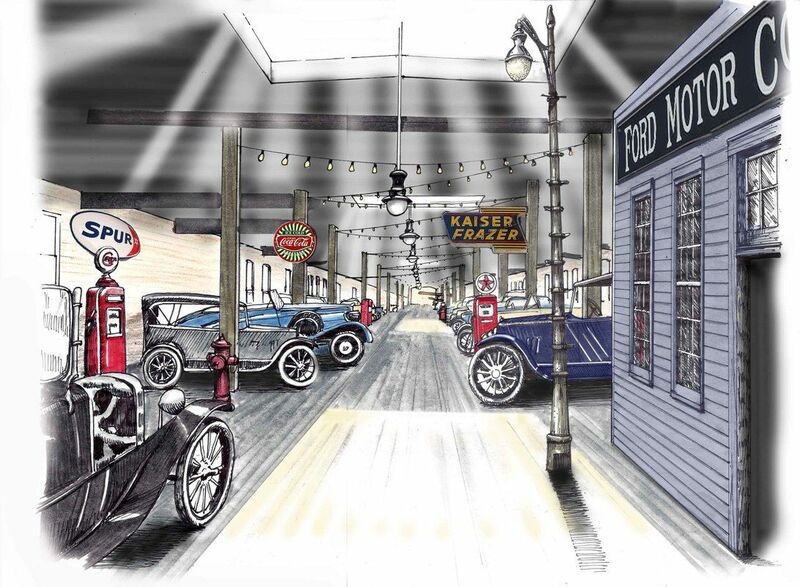 Marlies worked with the owner of the new Hackett Auto Museum and Event Venue in Jackson, MI to develop renderings of his vision. The building was originally the manufacturing site for the Hackett automobiles in the 1920's. It's time to design the downtown flower displays for 2019. I have had the privilege of designing the flower displays since 2012. 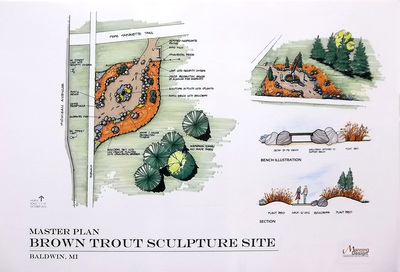 The Village of Baldwin commissioned a sculpture of the world's largest brown trout sculpture. 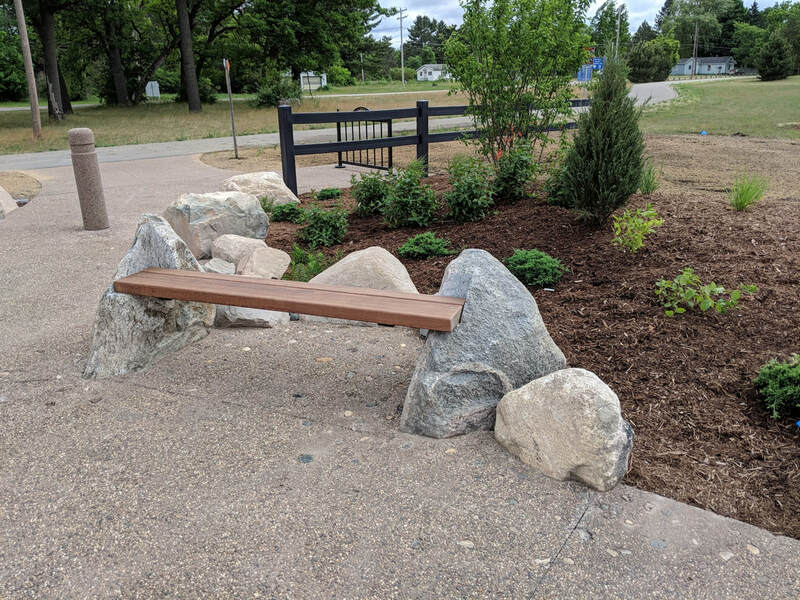 It was installed on May 6, 2018 near the Pere Marquette Rails to Trails trailhead, along M-37. The 25 ft. tall sculpture was created by Ivan Iler. 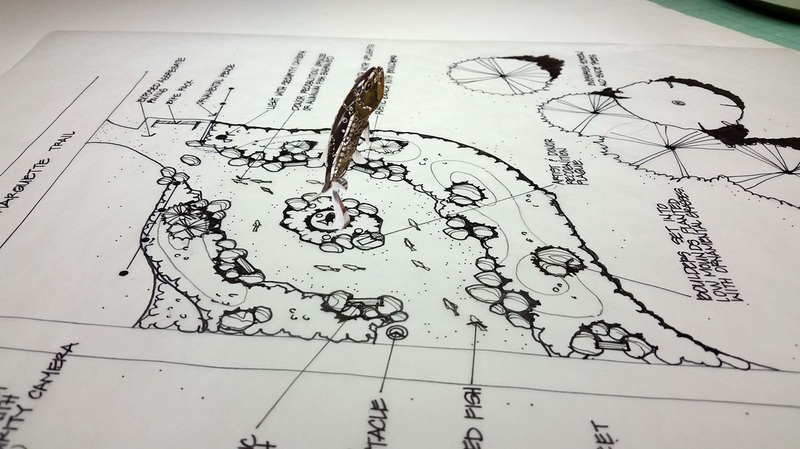 After a year of planning and design, the master plan by Manning Design is under construction. The goal was to create a strong sense of place that enhances the identity and pride of Baldwin's residents. 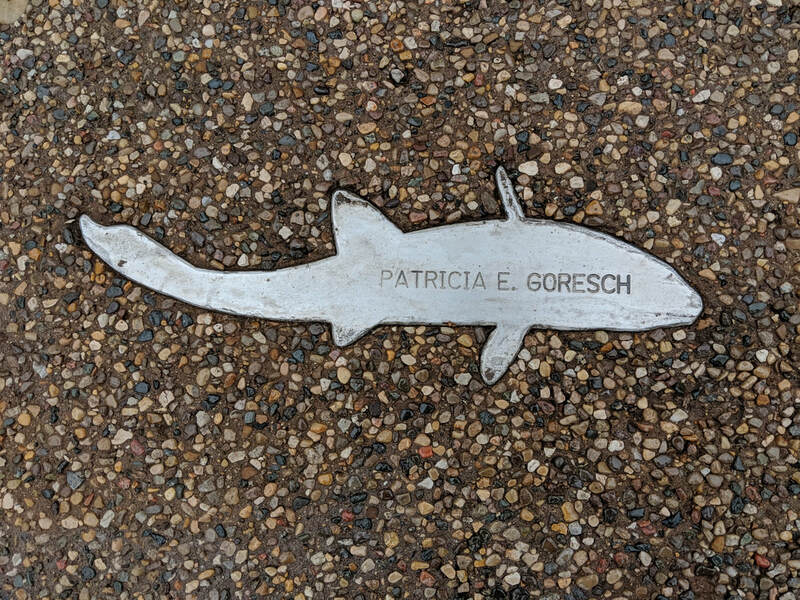 The sculpture is complemented with a "rocky stream" plaza, featuring custom made "boulder benches", engraved fish swimming through the pavement, and grasses and native wildflowers blooming along the edges. Marlies Manning provided construction administration services to the Baldwin DDA. 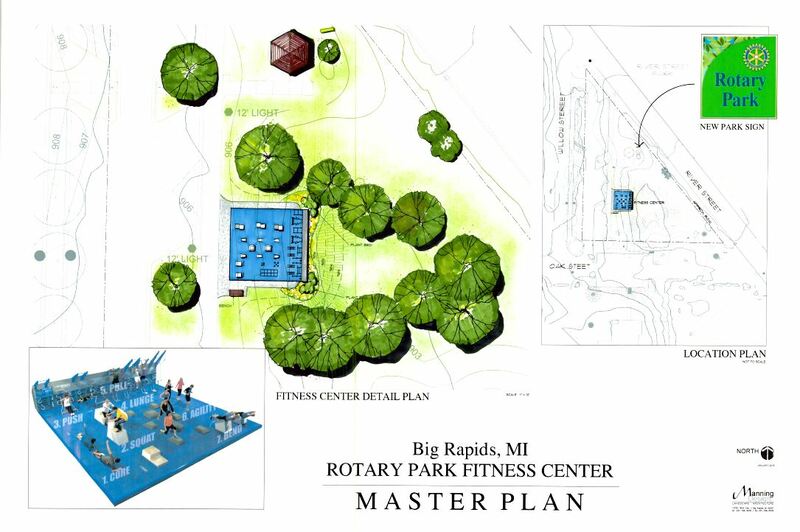 The Big Rapids Rotary Club, partnership with the City of Big Rapids has raised enough funds to provide a wonderful wellness park for the community. The Fitness Center will be advantageously located in Rotary Park, across from Spectrum Health Hospital and adjacent to Riverside Elementary School. 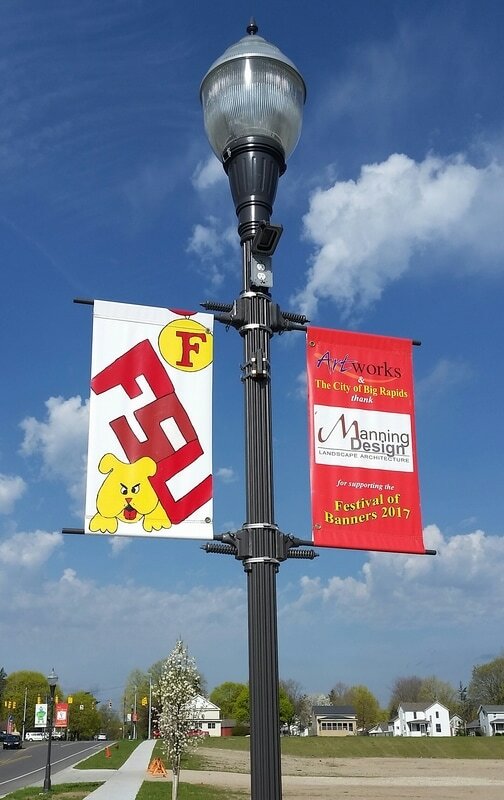 Manning Design provided Master Planning services and sign design. Construction is scheduled for 2019. Marlies worked with the Library staff, city staff, the Friends of the Library and the Library Board to develop a master plan for the grounds surrounding the library. The library plans to extend its programming outdoors and make use of a wonderful shady space as well as the open sunny space. The plan was completed in the summer of 2017 and the library has already begun implementing it. 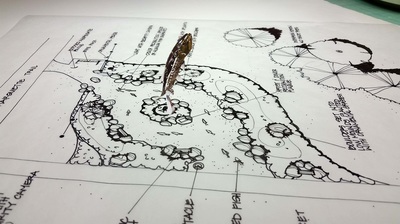 Manning Design completed the Master Plan for Mitchell Creek Park in 2013. 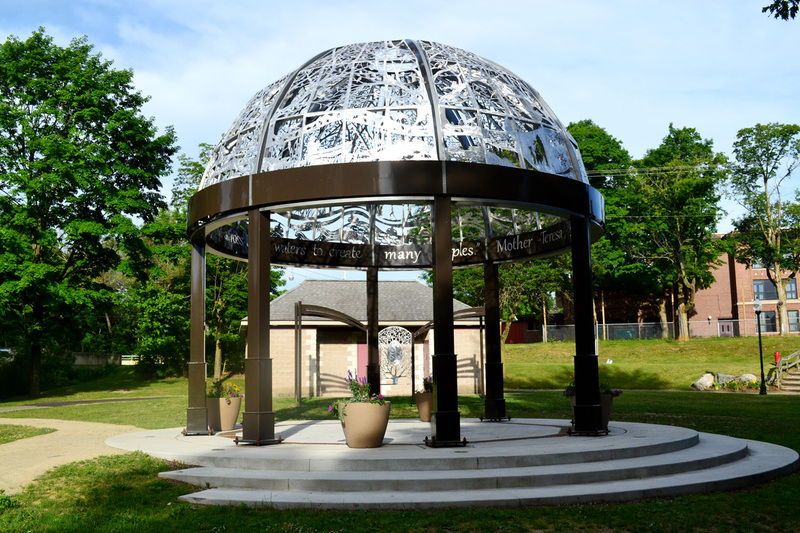 The City of Big Rapids asked Marlies Manning to design an ornamental pavilion as the focal point of the park. Marlies worked with the Ferris State University Welding and Technology Department to design and fabricate the pavilion structure. The students, under the supervision of Professor David Murray, created the 25 foot diameter, 23 foot high steel structure. The crowning glory of the pavilion is the laser cut aluminum dome. 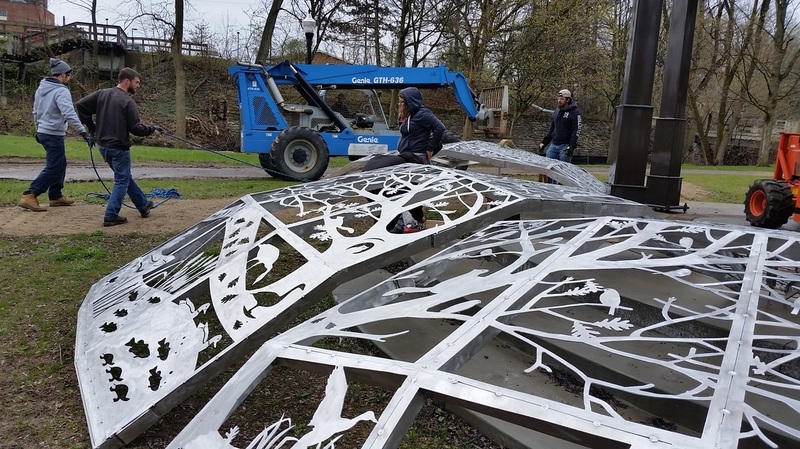 Marlies designed the artwork for the dome and prepared AutoCAD files for cutting the aluminum panels. 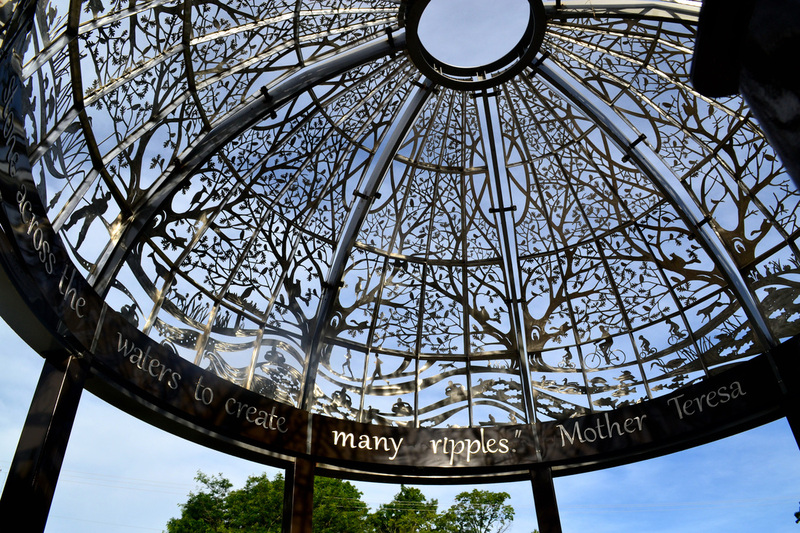 The eight sections of the dome tell the story of the community enjoying the Muskegon River and the trails in Big Rapids through the seasons. The dome was installed April 29, 2016 and dedicated September 9, 2016. 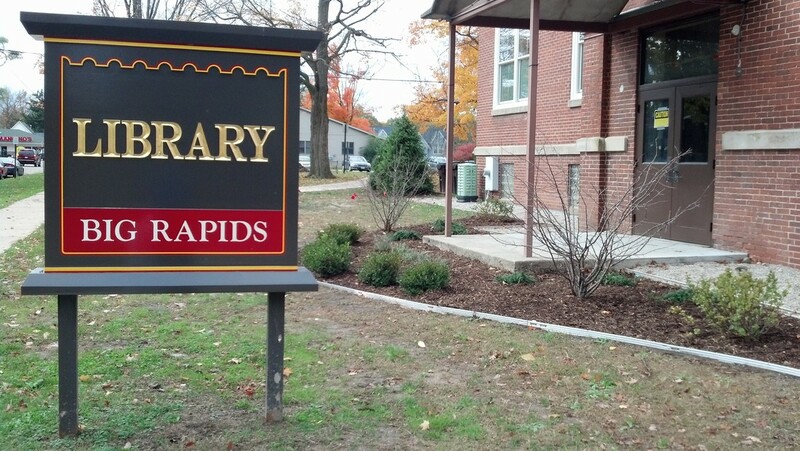 The City of Big Rapids received a grant to implement the master plan in 2017. 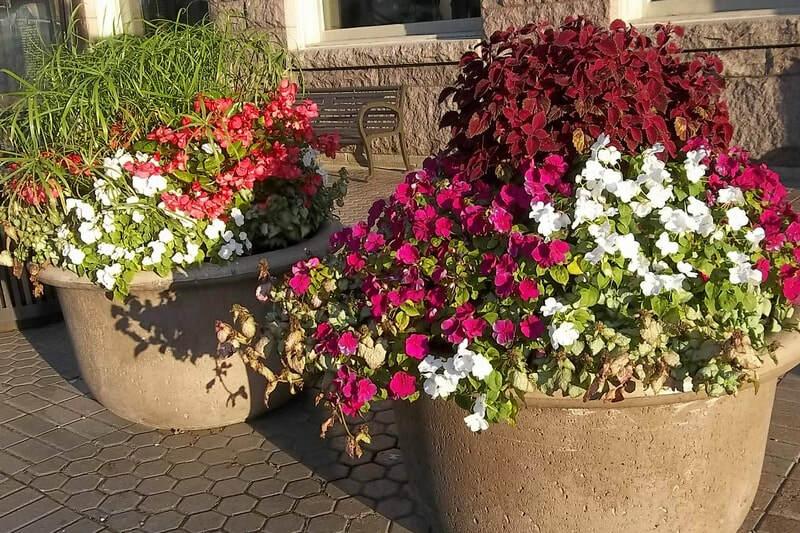 Construction of new walkways, lights, seating areas, parking, and landscaping was completed in the spring of 2018. Installation day with help from the F.S.U. Welding students. 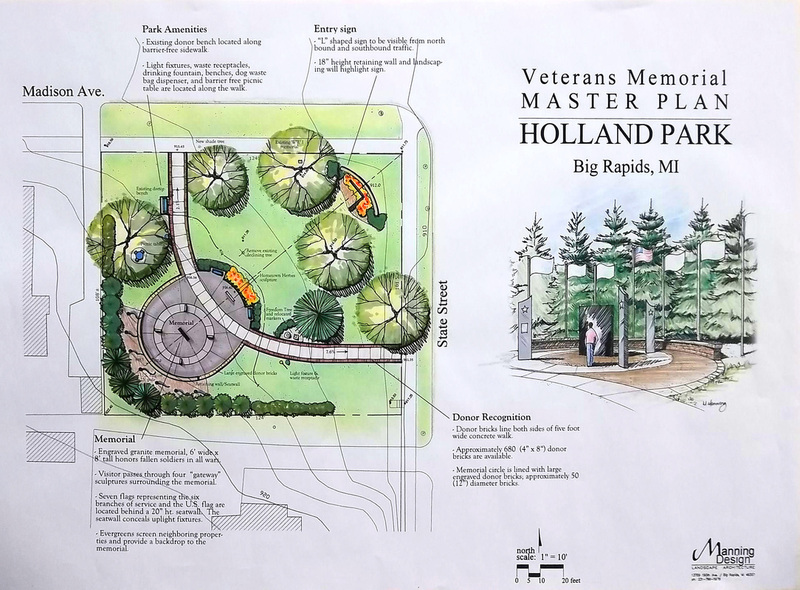 Manning Design worked with the City of Big Rapids and a citizens committee representing veterans of all wars to create and implement the Master Plan for a veterans' memorial park. 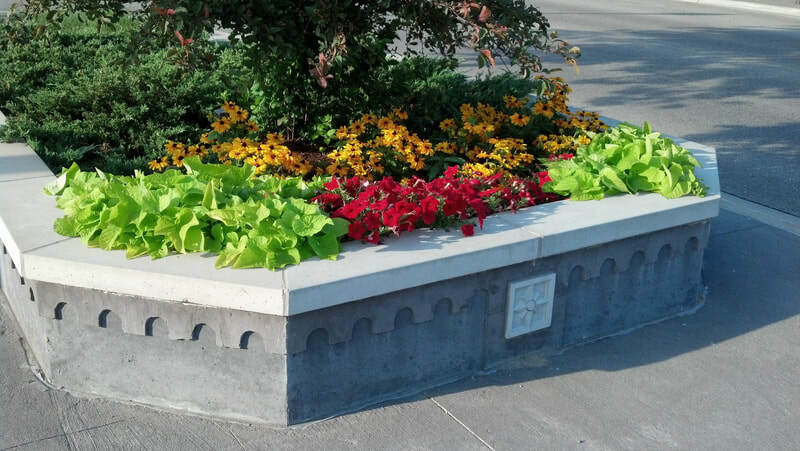 The park was developed in an existing under-utilized green space near the heart of downtown Big Rapids, in Holland Park, the oldest park in Big Rapids. 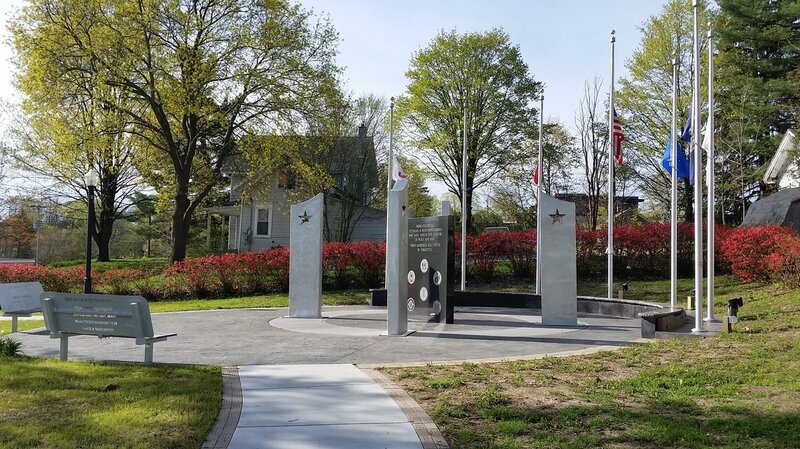 Manning Design prepared the master plan and designed the sculptures surrounding the granite memorial honoring the veterans. 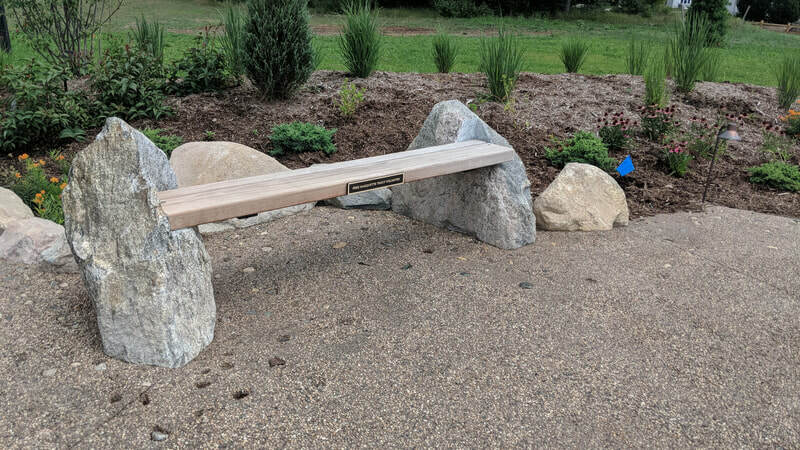 The park was completed in the spring of 2017 with the installation of a new Holland Park sign, a drinking fountain, and steps leading into the park from State St. Marlies is extremely proud to have played a role in the development of this park. 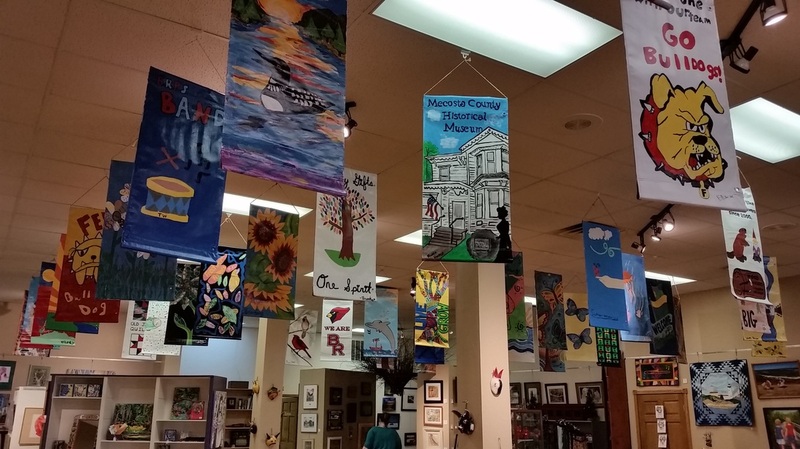 The completed banners on display in the Painted Turtle gift shop inside Artworks, prior to being hung on the light poles. This wonderful project began in 2016. 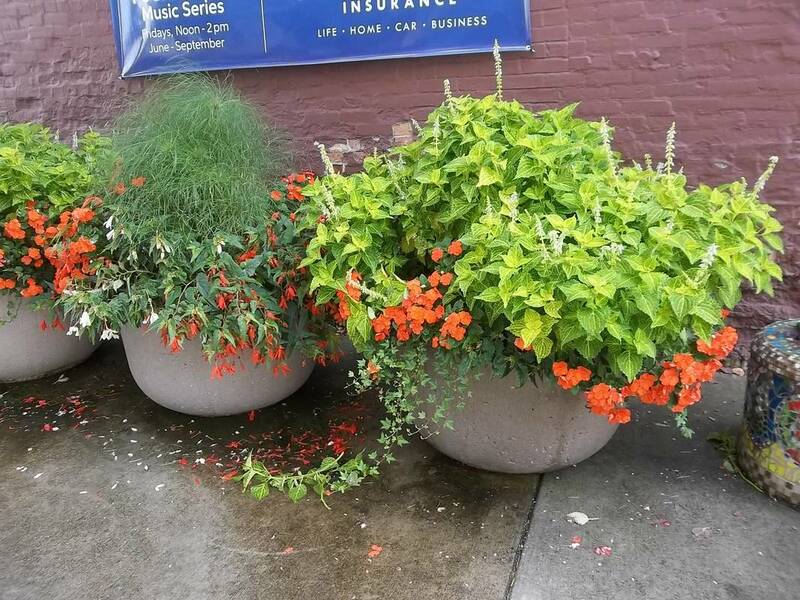 The project combines Marlies Manning's passion for community art with her connection to Artworks (Big Rapids' non-profit community art center) and the City of Big Rapids. Marlies is on the team that brings the project to fruition every year. The community is invited to paint their own designs on 106 banners that are displayed in downtown Big Rapids and the Baldwin St. bridge for the entire year, bringing art and community involvement to life.